This weekend, I framed this painting, one of three that I painted this week. This is another "Mountain Daydream," landscapes painted from my imagination but inspired by memories of the Rocky Mountains in Colorado, where I grew up. This is acrylic paint used as water media, on watercolor paper (9" x 12"). Yesterday I delivered it to Galatea Fine Arts (galateafineart.com), where it will be on display in September, in the "Artists' Alcove." This is the painting I have been working on lately, and I finally finished it this morning. 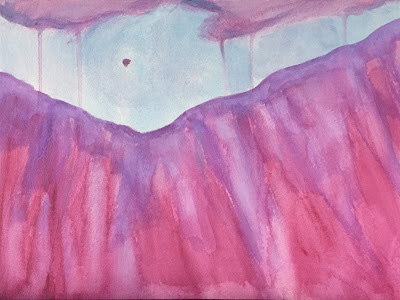 I added purple washes to the clouds and sky, and then added more pink to the base of the mountain. 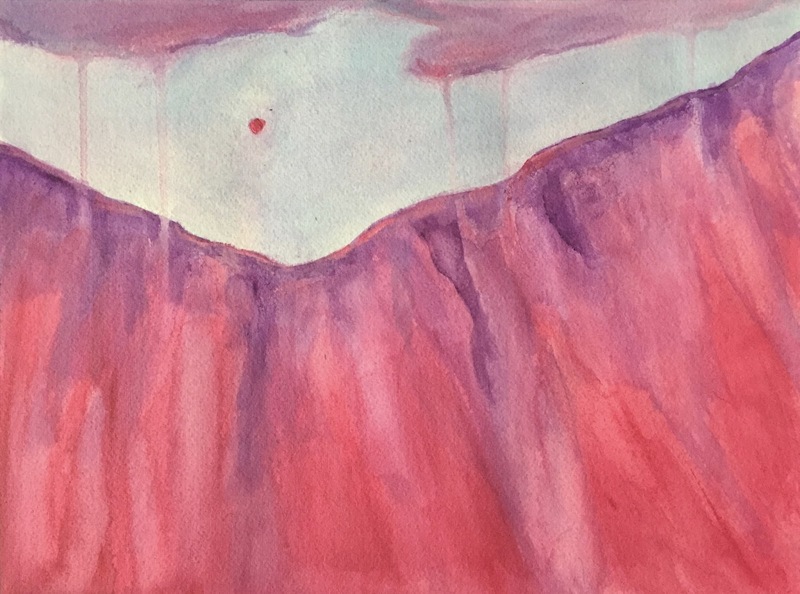 I added some purple outline to the top of the mountain, as well as some pale pink accent lines. I am glad I kept going with this one because I like it much better now. This is acrylic paint used with water on watercolor paper. It is one of my "Mountain Daydreams," painted from my imagination and memories of the mountains in Colorado. I started this painting on Thursday, and yesterday I did some more work on it. I added a pink wash to the clouds and a brighter pink wash to the mountains, especially the lower half. I also added blue and purple washes to the sky. This is better, but I think it needs a bit more work, so I will continue tomorrow. This is acrylic paint used with water on watercolor paper (9 x 12 inches). It is part of a series of paintings that I call "Mountain Daydreams" because I am painting from my imagination and from memories of the Colorado Rocky Mountains. This is another painting, only had enough time to get it started yesterday. This is another mountain landscape. 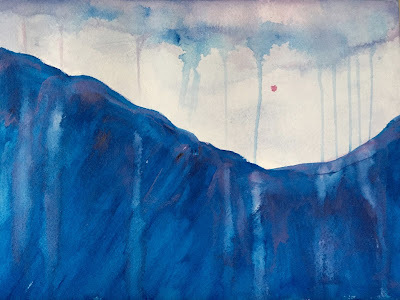 It is part of a series that i call "Mountain Daydreams, paintings created from my imagination and my memories of the Colorado Rocky Mountains. To be continued. . . This morning I finished this painting that I have been working on for the past few days. I added more purple to the sky and some purple washes to the mountain. I was going to do more, but I looked at it and decided that no more was needed and that it was done. 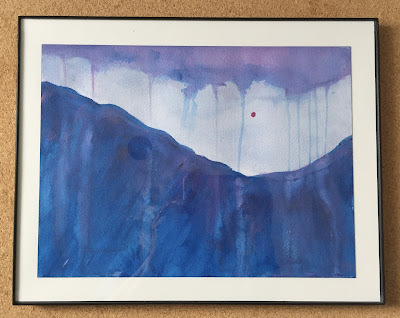 This is part of a series of landscapes that I call "Mountain Daydreams" because they are painted from my imagination and my memories of the Colorado Rockies. This morning I also got another painting started, and I plan to post it here tomorrow. This is the painting I started yesterday, and it is still a work in progress. I am working with acrylic paint and water, on watercolor paper. This painting is part of a series I call "Mountain Daydreams," created from my imagination and my memories of the Colorado Rocky Mountains. 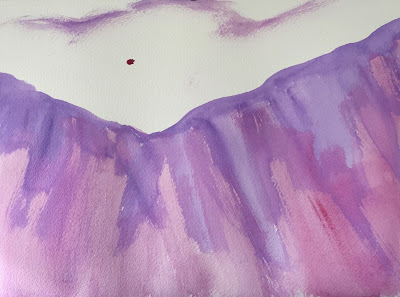 Today I added some pink and purple washes to the sky and the mountain. I like the mountain but want to do more with the sky, so I will continue tomorrow. I started another painting this morning, and it is still a work in progress. Like the painting I finished yesterday, this is acrylic paint used with water, on watercolor paper. 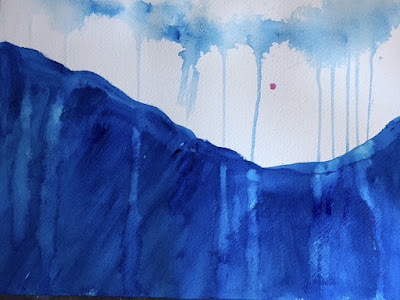 This is part of a series of mountain landscapes that I call "Mountain Daydreams" because I am working from my imagination and my memories of the Colorado Rockies. This is the painting that I have been working on this week. This is acrylic paint used with water on watercolor paper. This mountain landscape is part of a series I call "Mountain Daydreams," paintings created from my imagination and my memories of the Colorado mountains. Today I concentrated mostly on the sky, adding some pale washes to lighten the sky. I also added some highlights to the mountain top. This is almost done, though there are a few things I want to fix. You might notice that the color is very different from yesterday's photo. That's because I took this photo in the evening under artificial light, while yesterday's photo was taken in daylight. Today I did some more work on the painting I started yesterday. This is another one of my "mountain daydreams," painted my imagination and my memories of the Colorado mountains. This is acrylic paint used as water media, on watercolor paper. Today I added some washes to mountains and sky. This is still a work-in-progress, but I hope to finish it tomorrow. This is a painting that I started late this afternoon, a small mountain landscape. 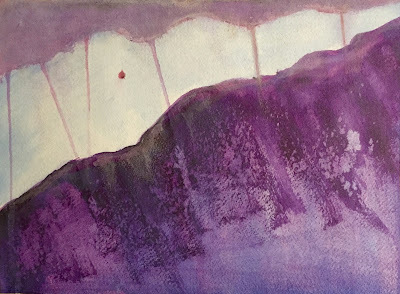 This is one of my "mountain daydreams," painted from my imagination but inspired by memories of the Colorado Rocky Mountains. Like other paintings in this series, this is done with acrylic paint used with water, on watercolor paper. This is a work in progress. Late this afternoon, I finally had a chance to work on this project. I am painting a portrait of this couple, using acrylic paint on canvas (14 x 18 inches). I am working from their vacation photo which shows them in Greece, riding on a motorbike and wearing sunglasses and helmets. In December, I did a pencil sketch as preparation, to get to know the faces. (The pencil sketch is posted here, December 14, 2016). I traced the main lines of the pencil sketch onto the canvas as a way to begin, and then switched to acrylic paint. Since then, I have been working on thin layers of paint, using only brown and white. Today I kept going in brown and white, make small changes, still using only brown and white. I concentrated on the faces, looking for dark and light areas. When I got stuck, I turned the canvas and the reference photo upside down because that always helps. I also made a few changes to the woman's helmet. Although each change was small, I think the changes are beginning to add up, and the likeness is coming along. 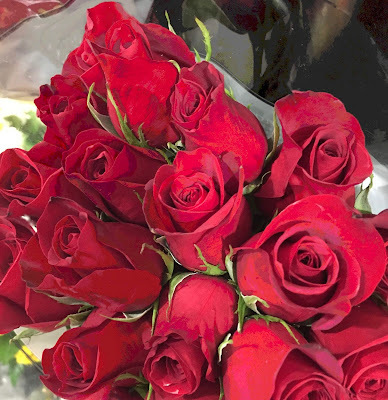 This afternoon while out shopping, I saw some roses on display, and took this photo. Tonight I edited it in Painter to simplify the background, and the added some posterizing effect. I decided to post this tonight in honor of Mrs. O., to say thanks for eight great years! She will be a hard act to follow. I returned to this project this morning. I am painting a double portrait of this couple, working from a vacation photo that shows them in Greece on a motor bike, wearing helmets and sunglasses. In December, I did a pencil sketch to get to know their faces. (The sketch is posted here Dec. 14, 2016). Then I used it as a guide when I was ready to start painting, tracing the main lines of the sketch onto the canvas, using graphite paper. Since then, I have been working out lights and darks with thin layers of acrylic paint, using only brown (burnt umber) and white. I will add color soon, but right now this is "underpainting". Today I started by making some more corrections to the faces and adding some light to them. I think the likeness is getting there. I measured features on the reference photo and the canvas, I turned the canvas upside-down and painted, and I looked at the painting in the mirror. All of that helps. I also worked a bit on both helmets and on the necks and shoulders. Finally, I worked on the sunglasses, adding lights and darks, working from the photo. I was surprised at by how much of a difference that made. Here is another version of the photo I posted here yesterday, this time processed through the Prisma app with the Mosiac filter. I took the original photo at Tendercrop Farms, on a recent run to get fruits and vegetables. 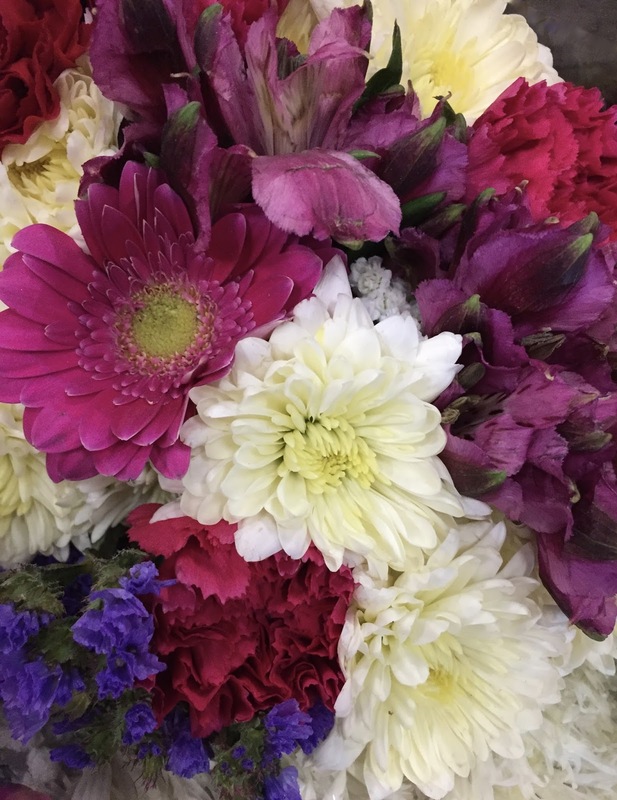 Here's another bouquet that I saw at Tendercrop Farms. Tonight I cropped the image to get this composition. I did a bit of retouching to eliminate a bit of distracting cellophane. I also created another version with a Prisma filter, and I plan to post that tomorrow. 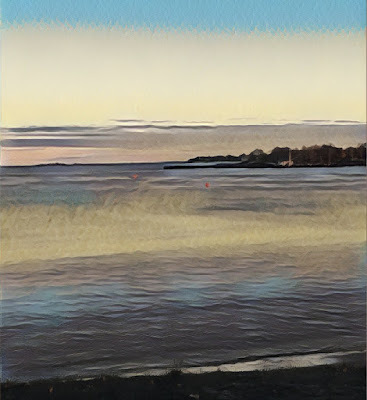 Here is another version of the photo that I posted here yesterday, this time with the Prisma mosaic filter (at about 80%). The original photo was taken at Tendercrop Farms, here in Beverly, MA, during a run to pick up fruits and veggies. Here north of Boston, spring always comes early -- in the grocery stores. A couple of days ago, we stopped off at Tendercrop Farms to pick up some fruits and vegetables. After I picked out apples and asparagus, I saw the flowers on display, so I took some pictures. I was excited to see tulips, a sign that spring is inevitable. 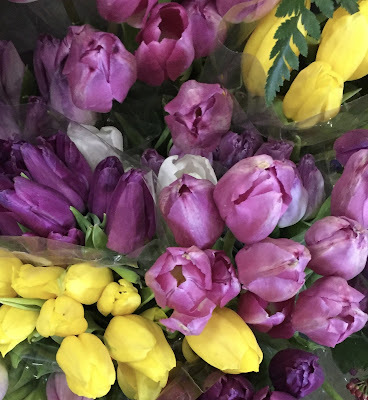 (Here north of Boston, spring often appears first in the grocery store!) Today I edited the original photo, cropping it to get this composition. While I was at it, I made a version with a Prisma filter, which I plan to post here tomorrow. This morning I worked on this project, a double portrait that I am painting. 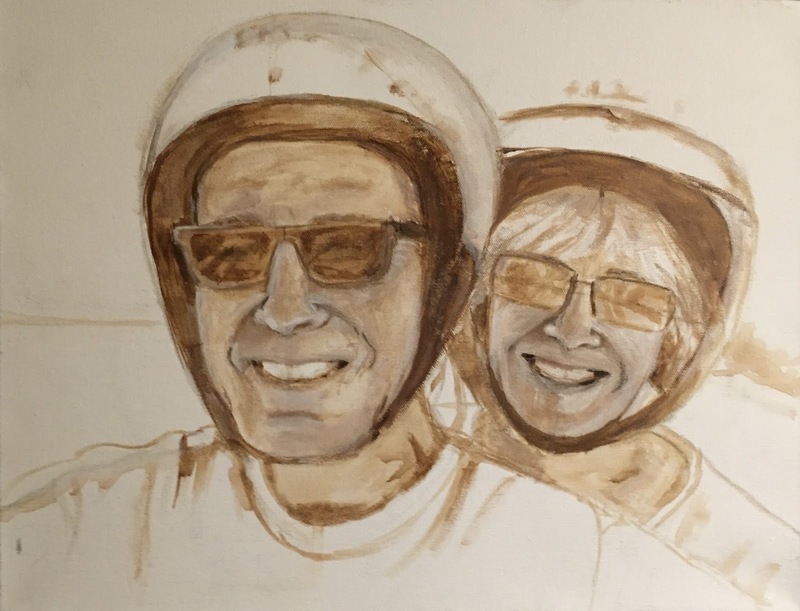 I am working from a vacation photo that shows this couple in Greece on a motor bike, wearing helmets and sunglasses. Last month, I drew a pencil sketch to get to know the faces. (The sketch is posted here Dec. 14, 2016). When I was ready to start this painting, I used the pencil sketch and some graphite paper to help me mark placement of objects on the canvas. From there, I did a little more drawing on the canvas in pencil, just so I could see the lines. Then I switched to paint. I am using thin layers of acrylic paint, and so far, only white and brown paint (burnt umber), just to identify light an dark areas. I will add more color later. Today I started by correcting some things that I knew I wanted to fix. Some changes had to do with facial features, but I did make adjustments to the size and shape of the man's helmet. Although I am always working towards a likeness, I am still trying to concentrate on whether or not things are in the right place. Today I used a ruler to measuring relative distances in the photo and to compare measurements on the canvas. This is the photo that I posted here yesterday, but this time I applied a filter with the Prisma app on my iPhone. i think the filter worked well on this image. This is another photo that I took on January 9. It had snowed the day before, but the next morning the sun was shining. 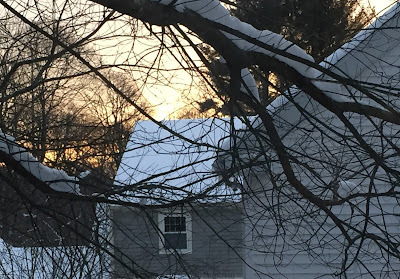 I looked out the window when I got up and saw this view, so I took a picture. Tonight I cropped the original to get this composition. I also created a version of this image using the Prisma app, and I plan to post it here tomorrow. 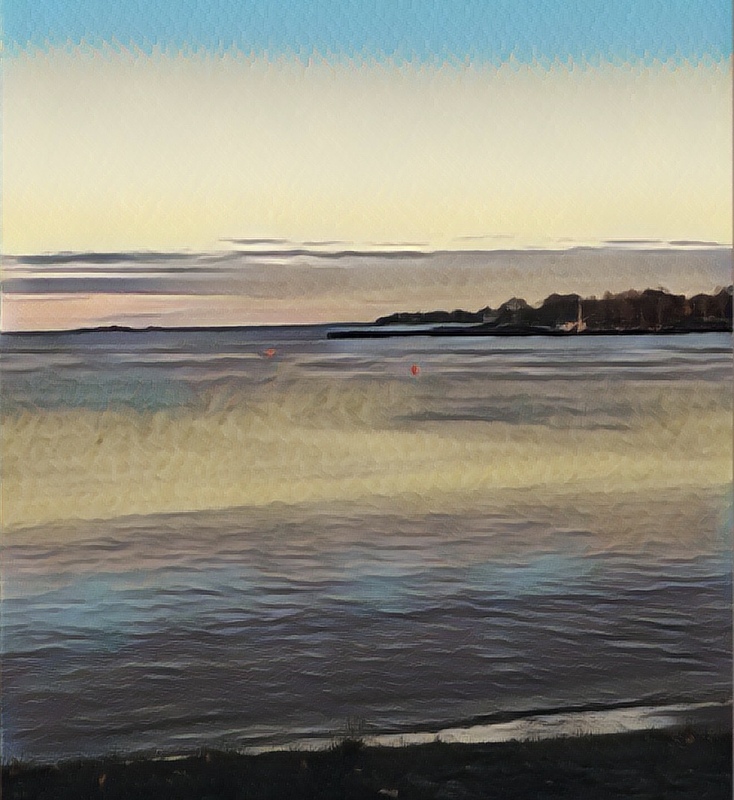 This is the same photo as in my previous post, but with one of the Prisma filters applied. The blinds are actually white, but they turned red with this filter, and I liked it. I also cropped the image to get this composition. We had a snowstorm yesterday and cold temperatures. I took this photo from an upstairs window. 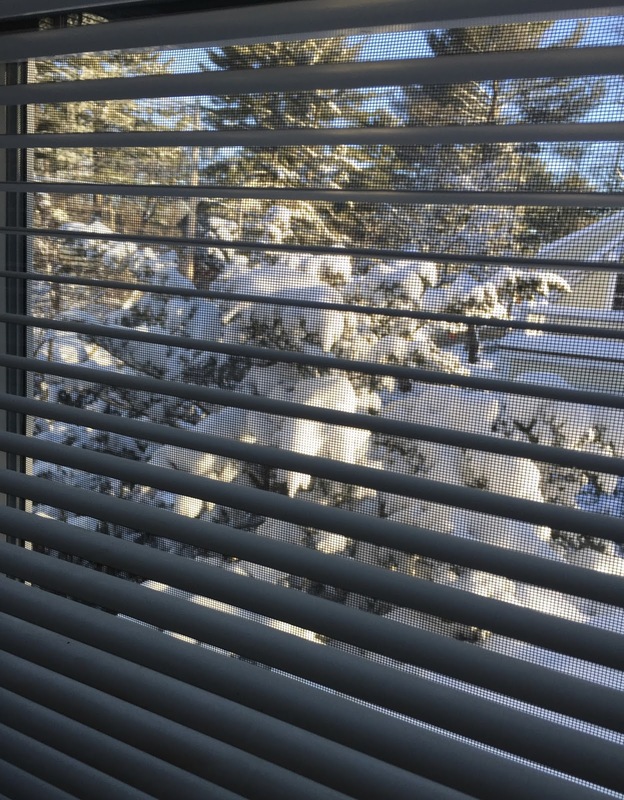 I like the textures and patterns of screen and blinds. I also used my Prisma app to try out some filters, and I plan to post the result tomorrow. This morning I continued working on this project, a portrait of a couple. 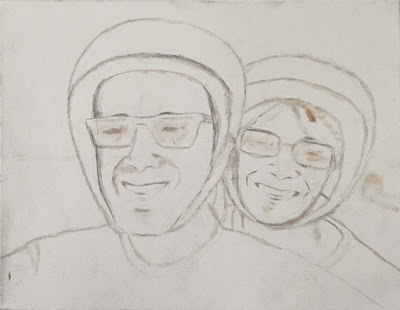 I am working from their vacation photo, taken in Greece, that shows them on a motor bike, wearing helmets and sunglasses. In December, I did a pencil sketch (posted here Dec. 14, 2016). Then a few days ago, I traced the basic lines of the pencil sketch onto the canvas, to help me get the painting started quickly. This gave me the basic positions, with a few lines, barely visible. After making sure I could actually see the lines I had traced, I switched to paint (acrylic). So far I am still using only white and brown paint (burnt umber) because I am not yet going for realistic color but just trying to see where the lights and darks areas. 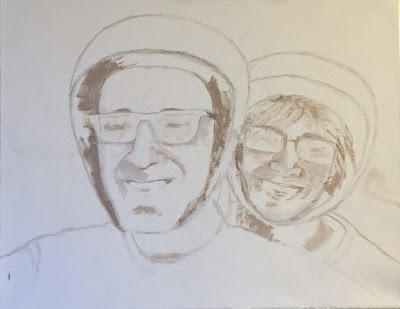 I am working from the photo, trying to make sure things are in the right place: facial features, sunglasses, helmets. Sometimes I am measuring, and sometimes looking at the painting in a mirror and sometimes even turning the painting upside-down. As I work I am already trying to get a likeness, but right now that isn't my primary focus. At this point I have more basic goals: does anything in the painting seem to defy the laws of physics, or of biology, etc.? Is this a believable picture of a man wearing a helmet, of a woman in sunglasses, of two people on a bike? Today I did a little more work on this painting. This is (obviously) a work-in-progress. I am just getting started. This will be a portrait of two people, painted with acrylics on canvas ( I 14 x 18 inches). 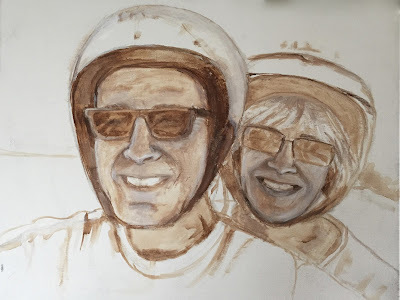 I am working from a vacation photo of this couple in Greece, riding a motorbike and wearing helmets and sunglasses). Last month, I worked on a pencil sketch as preparation, to learn the faces. (The pencil sketch is posted here, December 14, 2016.) I made a quick beginning of the painting by tracing the main lines of the pencil sketch, just to establish the positions of the figures and the main features. I did a little more drawing on the canvas with pencil, just so I could see the marks, and then switched to brown and white paint. Today I kept going with just brown and white paint, in thin layers of paint. This is underpainting only. At this point, I am not being too fussy about getting a likeness, but am just trying to make sure things are in the right place. 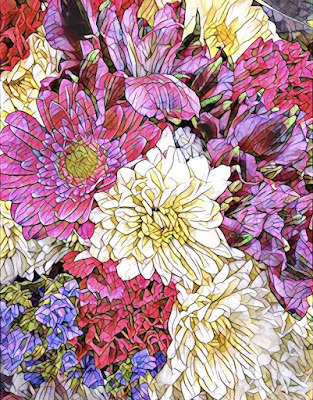 I decided to explore the Prisma app tonight (on my iPhone). I went back to a some photos that I took in November, at Independence Park, a waterfront park here in Beverly, MA. I picked out one of the photos still on my phone and tried out some filters till I found one I liked. (You can see the original version of this photo posted here on November 17, 2016.) 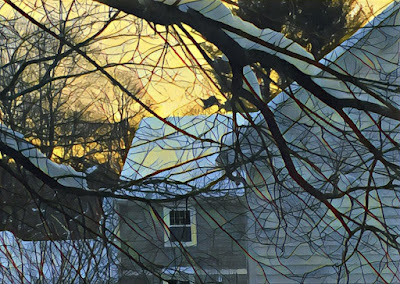 After I chose the filter and applied it, I transferred the image back into my desktop computer, and cropped it to match the format of the original. 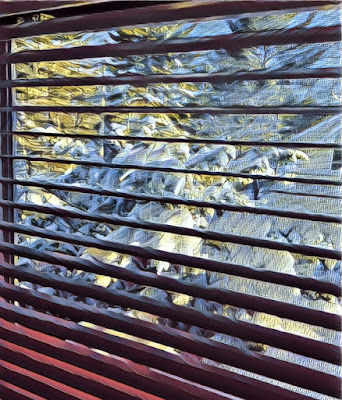 Prisma has made some improvements, and apparently, they no longer slap a "Prisma" label in the lower right corner. Hooray! This is a painting that I am just getting underway. This is going to be a portrait of two people, in acrylics on canvas ( I 14 x 18 inches). 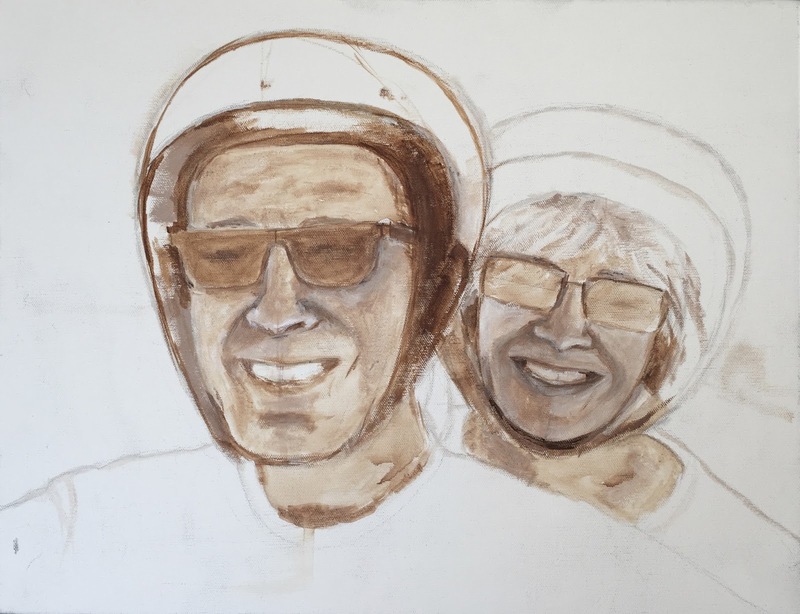 I am working from a photo of this couple, riding a motorbike in Greece (wearing helmets and sunglasses). Back in December, I worked on a pencil sketch as preparation, to learn the faces. (The pencil sketch is posted here, December 14, 2016.) Yesterday I jump-started the painted portrait by tracing the main lines of the pencil sketch onto the canvas. (I used graphite paper and put tape over the pencil tip so I wouldn't make in marks on the sketch.) This gave me just some very light marks on the canvas, pretty hard to see, but I could make out the position of the figures, the helmets, and the main facial features. So then I used pencil right on the canvas to make those marks easier to see. Then I switched to paint, some neutral beige (brown and white) and started painting, starting by making the marks and lines on the canvas easier to see. That was as far as I got yesterday. This afternoon, I didn't have a lot of time, but I worked on this anyway. I already could see things I needed to fix. (Portrait painting is all about making many mistakes and then correcting them.) So I mixed up some more neutral paint (brown, beige, and white) and made some of the changes. Then I used the paint to indicate light and dark areas. I worked mostly from the original photo, but sometimes looking at the sketch too I only worked for about 40 minutes, but now I feel that I have made a start. It is finally time to get this portrait started. 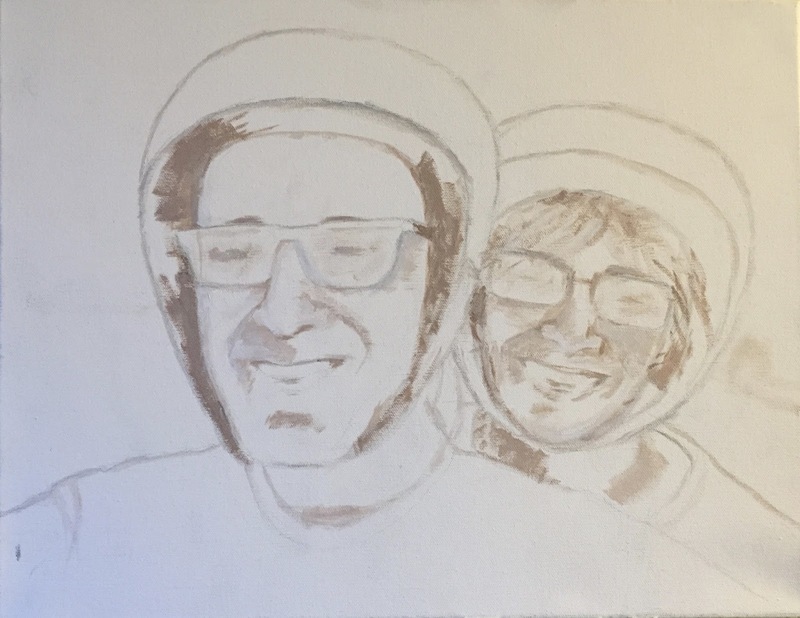 I am painting a double portrait, working in acrylics on a 14 x 18 inch canvas. 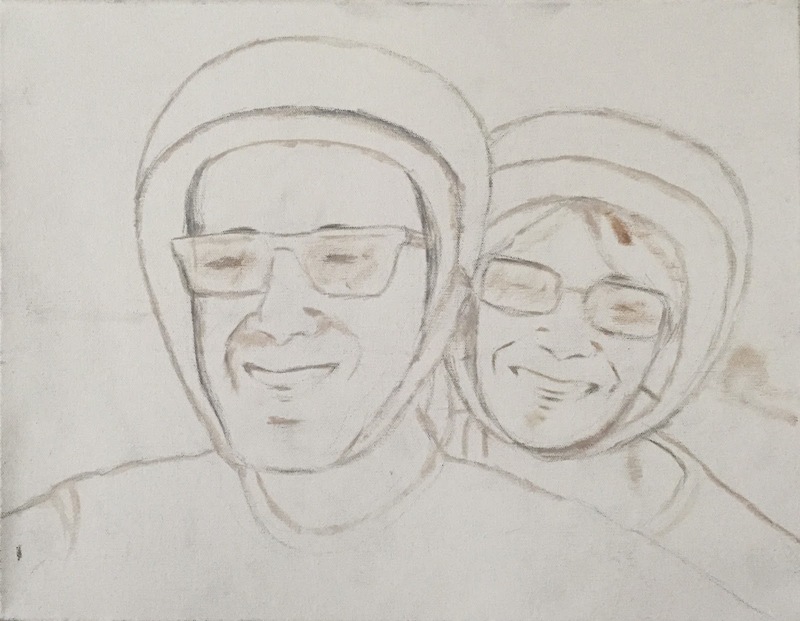 My reference is a vacation photo of the couple, riding a motorbike in Greece (wearing helmets and sunglasses). Back in December, I worked on a pencil sketch as preparation, to learn the faces. (The pencil sketch is posted here, December 14, 2016.) I am pretty happy with the sketch, and had managed to work out placement issues and the position of the two helmets. The pencil sketch is about the same size as the canvas, so I decided to use it to jump start the painting. I put a big piece of graphite paper over the blank canvas, and then positioned the pencil sketch over it. I then went over the main lines of the portrait, using a pencil with Scotch tape over the tip (so I wouldn't make marks on the sketch). When I was finished, I had some very light marks on the canvas. They were hard to see, but the position of the figures, helmets, and main features were pretty much there. Then I did more drawing on the canvas with pencil, to make the lines and marks easier to see where I was. Then I switched to some pale brown acrylic paint, and started painting over the marks. That was a much as I had time to do. I think it helped to start this way, but even so, portrait painting is a struggle. But I am looking forward to it, and happy to be getting underway. 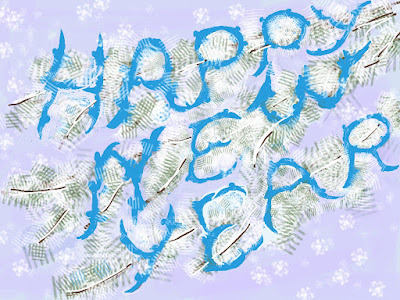 This digital drawing is the final frame of a little animation that I posted recently, "Happy New Year" spelled out by bluebirds in formation. I made this with the Brushes app on my iPad: as you draw, it records every stroke and the result is a little animation. So, here is the drawing, which is also the final frame of the video. If you want to see the video, it is posted here on Jan. 1, 2017. 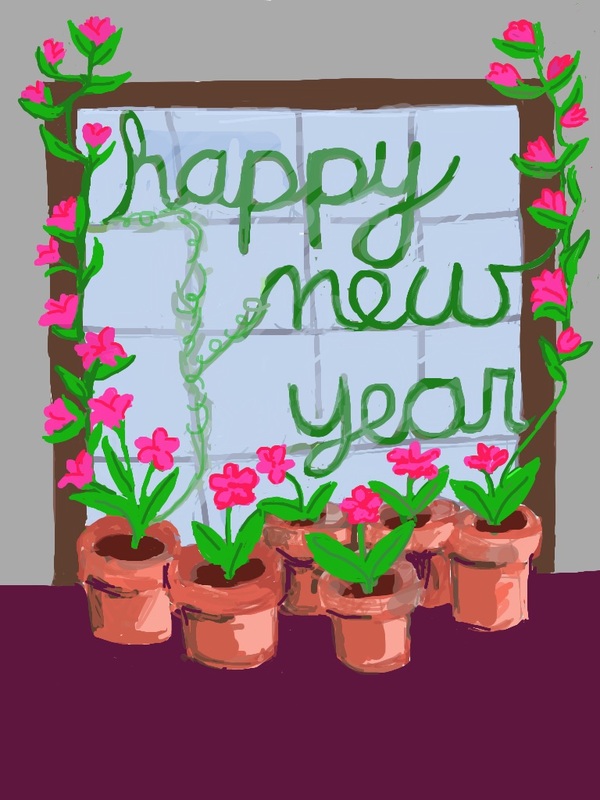 I recently posted an animation that I made for New Years, flowers blooming around a window. 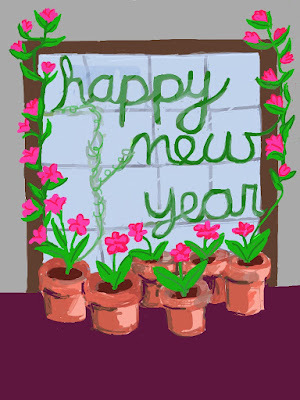 I used the Brushes app on my iPad for this project: as you draw, it records every mark and the result is a little video. Anyway, here is the drawing, which is also the final frame of the video. If you want to see the video, it is posted here on Dec. 31, 2016. Here's another little animation I created with the Brushes app on my iPad, which captures your drawing as you create it. It took a little too long for those birds to get organized.